Number formatting allows TrackVia Users to modify the display of number fields in TrackVia and ensure a consistent presentation through their application. 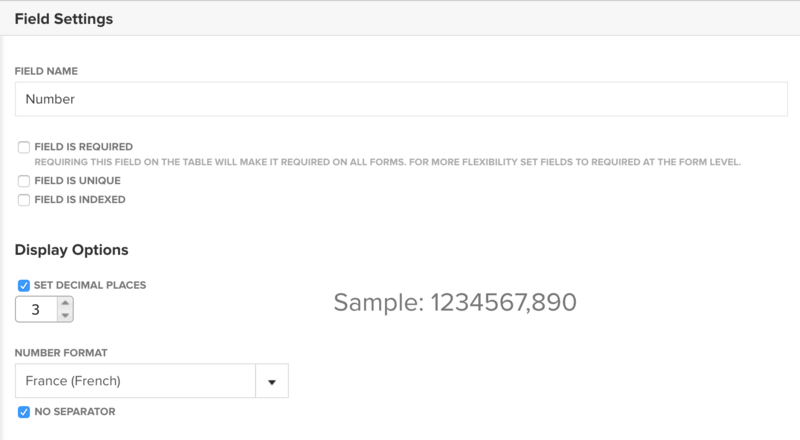 Number formatting can be applied to Number, Percentage, and Currency fields. It can also be applied to Calculated Number, Calculated Percentage, Calculated Currency, Triggered Number, Triggered Percentage, and Triggered Currency fields. When adding or editing a numeric field in the Table Designer, admins can customize the field's format by modifying the Display Options. Admins have the ability to customize the number of decimal places to display in a field, ranging from zero to six. Setting the number of decimals to display does not alter, or round, the underlying value in the database. When selecting Set Decimal Places and entering the value of "0", a number whose underlying value is 1.333 will display as "1" to the end user. The underlying value of 1.333 remains intact to ensure accuracy if applied to additional calculations. Additionally, a country-based number format can be selected in the Display Options. This can be further customized by choosing to display comma separators for large numbers. Currency field types have additional customization options with the ability to select a preferred currency. Moreover, a table can have one currency field output in Yen and another currency field output in US Dollars. These settings are applicable to Currency, Calculated Currency, and Triggered Currency fields. 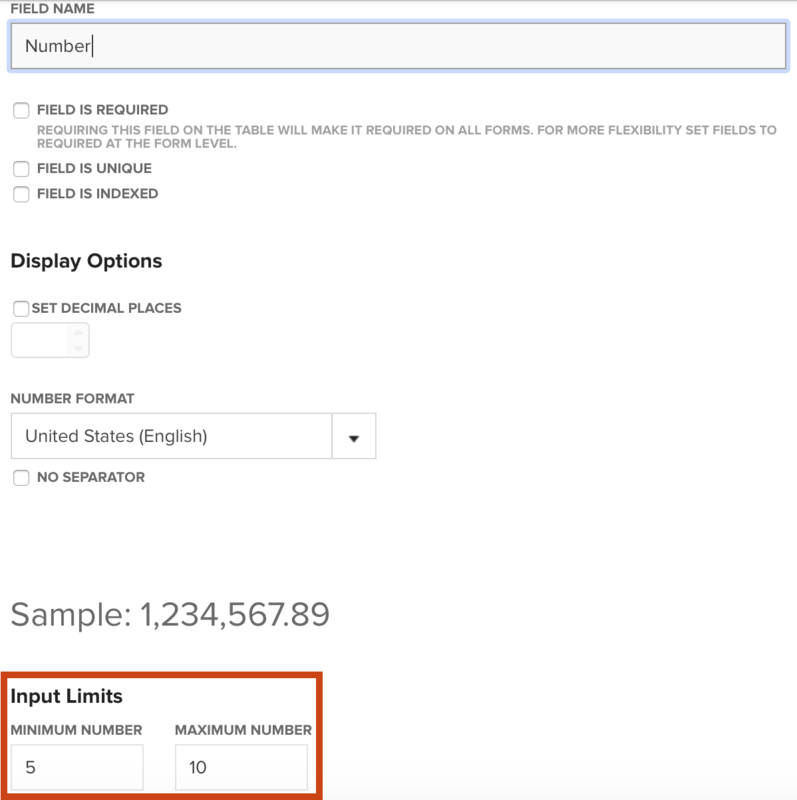 Number field types can be further customized by requiring a value to fall within a specified range by setting minimum and maximum allowed values. This could be useful in a sales environment, allowing a user to create a cost quote within a predefined range to ensure profitability. Minimum and maximum values can also be used to ensure a specific character length of a field. For example, a number field type can be used to enter a year. To ensure four digits are displayed, a minimum value might be set to 1900 and a maximum value of 2050. To reference the year 2015, a user needs to enter the full year, as "15" would not be accepted. Users who attempt to enter a value outside the designated range will receive an error message and be prevented from saving a record.